Tokyo, September 02, 2014: Tata Consultancy Services (BSE: 532540, NSE: TCS), the leading IT services, consulting and business solutions firm today announced that it has initiated a new learning program for its trainee graduates in Japan. 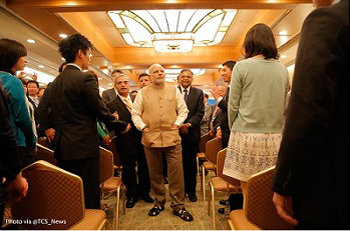 The Honorable Prime Minister of India, Shri Narendra Modi was the Chief Guest at the inauguration of the TCS Japan Technology and Culture Academy, which is aimed at enhancing the technology and cultural knowledge and understanding between Indian and Japanese IT professionals. The Hon’ble Prime Minister of India flagged off the first batch of 48 TCS Japan trainees who will proceed to India to undergo training for 6-8 weeks at various TCS locations. Apart from increasing their exposure to new technologies, the TCS Japan graduate trainees will learn about quality and other processes as well as business skills. This will be followed by on-the-job training on projects for six months. 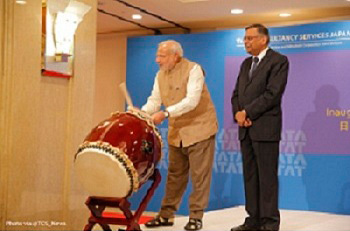 “We are delighted that the Hon’ble Prime Minister of India, Shri Narendra Modi is here with us to flag off an important learning initiative that will help TCS-ers from Japan and India work collaboratively together, said N Chandrasekaran, CEO and MD, TCS. Tata Consultancy Services Japan will initially house more than 4,000 employees in Japan and a dedicated centre located in Pune, India. TCS Japan provides Japanese companies a unique mix of global talent and capabilities combined with local expertise and knowledge that will help Japanese corporations transform and globalise effectively and drive growth going forward. Tata Consultancy Services is an IT services, consulting and business solutions organization that delivers real results to global business, ensuring a level of certainty no other firm can match. TCS offers a consulting-led, integrated portfolio of IT, BPS, infrastructure, engineering and assurance services. This is delivered through its unique Global Network Delivery Model™,recognized as the benchmark of excellence in software development. A part of the Tata group, India’s largest industrial conglomerate, TCS has over 353,000 of the world’s best-trained consultants in 46 countries. The company generated consolidated revenues of US $16.5 billion for year ended March 31, 2016 and is listed on the National Stock Exchange and Bombay Stock Exchange in India. For more information, visit us at www.tcs.com.